Posted by Jon in Rehomed on Tuesday 13/06/2017 08:40 UTC. Description: Howdy, our names are Buddy and Lilly. We are one years old ( our birthday is this month!) and are white mini lops with blue eyes! About me: We arrived together at the centre on the 9/4/17. We were an unwanted child's pet. Temperament: We are a confident, friendly little bunch who love to explore. Buddy is slightly larger then Lilly ( how you tell them apart 😉 ) We love fuss and are good to handle. Type Of Home Wanted: We would suit a young child upwards. We must be rehomed together. 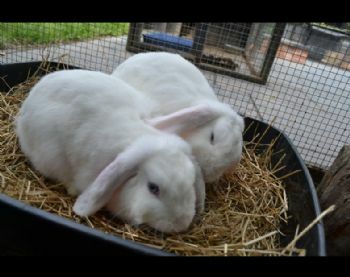 We would make an indoor or outdoor rabbit as we are fairly clean, litter trained but we do dig. General Health: We are up to date with our vaccinations and have both been neutered. We are both in good health. Adoption fee: To help the charity cover the costs of neutering, vaccinations and housing costs. We ask for a minimal donation of £75. 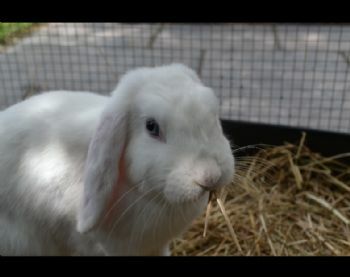 Rehoming Procedure: Contact us to arrange an appoinment to see the rabbits and we can use this time to answer any questions you may have. If you do fall in love then we arrange a time to conduct a home check. Within this we see whether your set up is suitable. We ask that all hutches to be to the size the RWAF recommend which is 6ft x 2ft x 2ft with a run attached of up to 5-6ft squared. The hutch and run must be weather and fox proof. For indoor rabbits we check that you have a good space when it comes to locking up. Please bring with you photographic evidence of your set up. Once the home check has been done and the adoption papers filled, you are free to begin life with your new buddy! If you think you can offer Buddy & Lilly a "furever home" please do not hesitate to contact us using the details below. We are not open to the public and viewing is by appointment only.